Back in 2007 I had the wonderful privilege to work at Web Africa, one of the largest internet service providers in South Africa. One of my PHP projects (or at least a small part of the project) involved creating an autocomplete textbox when searching for domains located within the company MySQL database. If memory serves me correctly (it probably doesn't) that's around the same time Google introduced Google suggests at Google labs - something that is standard to its search these days. 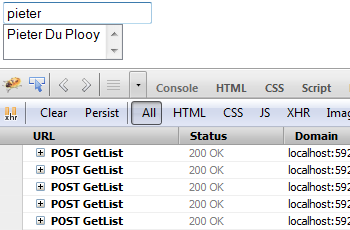 Last month we needed the same functionality in one of our ASP.NET projects at my current company. The first argument to the AutoComplete function contains the ID of the textbox we wish to autocomplete, the second the maximum amount of results to return, third the timeout - how long the script needs to wait (in milliseconds) before it attempts to query the server. The fourth argument is where it gets a little bit more interesting, when using PageMethods an object named PageMethods becomes available to our scripts, when using a webservice the scriptmanager will create an object thats got the same name as the class name we gave our webservice. In this example the object will be named MyService (if you use namespaces you'll need to include that in your object as well e.g. 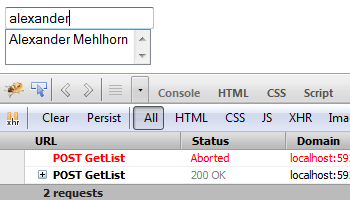 MyNamespace.MyService), now instead of passing the PageMethods object to the function, you can alternatively pass the MyService object to the function (these objects are interchangeable). The last argument obviously tells the function which method to call e.g. GetList. Lets dig a bit deeper to see how all of this works. Notice the $addHandler function, this is function available courtesy of the scriptmanager - since browsers like IE and FireFox handle events differently, we need a crossbrowser friendly function to attach events. 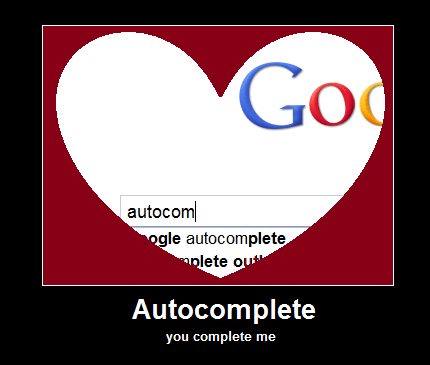 The success function like seen below (nested within the AutoComplete giving it access to all its "private" fields), gets executed if the request successfully executes - populating the autcomplete listbox. In the following snippet we attach a handler to the page which assigns the selected item to the specified target and hides the active listbox. In the next part of this post we're going to have a quick look at how to use an autocomplete extender control that microsoft created (which should represent a more mature solution). After a week of searching online... you are the man, thank you. Well done and thanks for sharing. Nice and light and easy to understand. Hi Tom Yes most definitely, in fact I've even converted it into a ServerControl. I am actually busy writing part 3 of this "series", which revolves around this idea and should be available by the end of the week (and will be sure to include how to use this in an UserControl) The main "catch" around using it as a reusable AutoComplete UserControl is how to handle the client side load event, everything else is pretty much straightforward. Hi, is there a way to use it in UserControl?